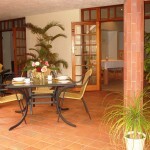 Experience a friendly welcome at Touraco Guesthouse. Touraco Guesthose is one of South Africa’s first guesthouses that is fully geared for “loadshedding” (power failures) by supplying you with eco-friendly Solar Power & Battery Power! 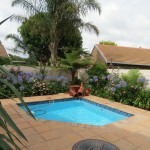 Set in a quiet cul-de-sac, in a peaceful well established residential area in the East of Pretoria, a friendly welcome awaits at Touraco Guesthouse where you will be exposed to an outstanding bed and breakfast experience. 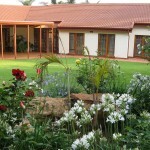 The 7-room Guesthouse overlooks a peaceful, well- established garden featuring a overwhelming number of roses and inhabited by a profusion of indigenous birds. Superb, personalized services are provided by the owner, Irene Kahle. These include imaginative, delicious breakfasts which are served indoors or on the patio. In addition to the sumptuous full English breakfast on offer, a great variety of special dishes, an assortments of fresh fruit and homemade breads and muffins render every breakfast as “Amazing, Creative and Yummy” – to quote some of the clients remarks. Ideally positioned with easy access to N4 and N1 highways, this guesthouse is suitable for business as well as leisure travel. The CSIR, Innovation Hub, Willows Hospital (Wilgers Hospital), The Nose Clinic, The University of Pretoria and Waltloo Industrial Area are in close proximity, as well a wide variety of good restaurants and shopping opportunities in The Grove & Menlyn Shopping Centres. For guests arriving at the International O.R.Tambo Airport after a long flight, Touraco Guesthouse offers the ideal opportunity to relax and sleep over before departing on your South African holiday. Airport transfers in our own luxury, air-conditioned tourist vehicles can gladly be arranged, should guests prefer not to drive themselves. In Addition Touraco Travel Services offers a wide variety of Day Tours, Safaris and Tours from our offices, situated in the reception area of Touraco Guesthouse. 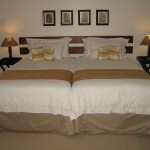 Touraco Day Tours & Safaris depart from and return to the Guesthouse. Guests have the added benefit of getting expert advice from the hosts regarding their holiday and route planning. A true Touraco “one-stop” holiday service.